How SAP Leonardo accompanied with IoT can be leveraged to minimise production downtime with predictive maintenance. How SAP Leonardo, accompanied by IoT, can be leveraged to minimise production downtime with predictive maintenance. 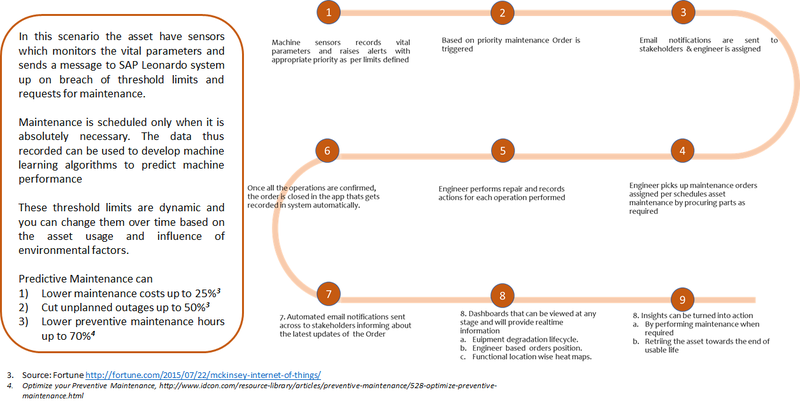 Building upon the blog series on “Turning digital aspirations into reality with SAP Leonardo and Capgemini,” we will be looking at how SAP Leonardo, together with the Internet of Things (IoT), can be leveraged to minimize production downtime with predictive maintenance. Most organizations look after their assets and take corrective measures only when they stop working. There are some organizations that are slightly better off as they perform periodic maintenance to control failures, but that often turns out to be costly and you also need planned downtime to carry out maintenance. Corrective maintenance can be extremely costly as failure is unpredictable and can also pose a risk to employee safety. Similarly, planned periodic maintenance, although effective, is often too costly and can also result in over-maintenance of your assets. In today’s changing times, organizations can benefit from the best of both; i.e., corrective as well as planned periodic maintenance—if they listen to their assets. There are internal factors such as usage of the asset and external factors such as environment in which the asset is used that influence asset performance. If organizations listen to their assets and their environment, they will be able to better predict when maintenance is required and plan repairs with greater efficiency to have minimal impact on productivity. 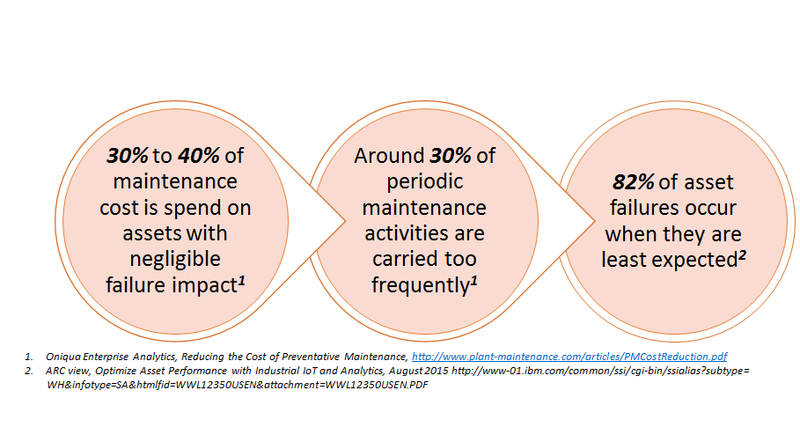 The graphic below presents some interesting statistics about planned periodic maintenance. Organizations can listen to their assets using modern-day sensors and IoT. Parameters such as pressure, temperature, motion, and many more can be easily tracked to measure the condition of an asset and therefore trigger maintenance activities only when required. This way of tracking assets not only helps prevent failure and breakdown, but also can assist in predicting asset performance over a period under variable conditions. Ensure employee safety and increase employee efficiency. Most organizations today have a digital transformation strategy to enable their businesses to adopt newer ways of working. Organizations that want to reduce their maintenance costs and boost productivity should certainly implement predictive maintenance for their assets. Capgemini and SAP have partnered under the “Fast Digital for Discrete Industries” initiative to deliver targeted solutions and accelerators using the SAP Leonardo platform. These offerings can set your business up for success. By leveraging IoT, Machine Learning, Big Data, and a host of other cutting-edge technologies, together we can empower your business to become leaner and more efficient than ever before, thus creating an upward spiral of improvement and innovation that can only deliver better value with lesser cost. This is just one individual case where SAP Leonardo can be leveraged to meet and exceed expectations, deflating one of the many challenges that asset manufactures or users face each day. Fraud detection in relations to assets deployed. The possibilities are endless if you start listening to your assets. As industry prepares for the fifth industrial revolution, organizations must not only upgrade their IT systems, but also invest in smart assets by digitizing their existing investments. Capgemini experts, with their rich business and technology knowledge, can help you innovate with SAP Leonardo by identifying use cases and applying design thinking to develop a minimum viable product that you can test and deploy across your assets. Find more information on the Capgemini Leonardo Services website.